Cyn: Welcome to Creative Writing 381. There will be no writing creatively. 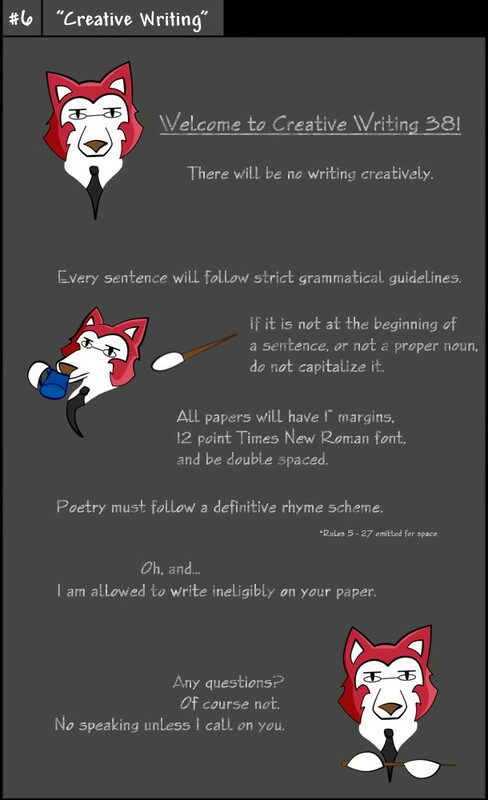 Every sentence will follow strict grammatical guidelines. If it is not at the beginning of a sentence, or not a proper noun, do not capitalize it. All papers will have 1″ margins, 12 point Times New Roman font, and be double spaced. Poetry must follow a definitive rhyme scheme. *Rules 5-27 omitted for space. Oh, and… I am allowed to write ineligibly on your paper. Any questions? Of course not. No speaking unless I call on you.